Photo Caption: Last year’s New Artist of the Year winner Brandon Heath passes the torch to labelmates Tenth Avenue North, who were honored last night with the 2009 Gospel Music Association Dove Award for New Artist of the Year. Brandon received 3 Dove Awards including Artist of the Year and Male Vocalist of the Year. Pictured L-R: Mike Donehey, Scott Sanders, Jason Jamison, Jeff Owen and Brandon Heath. 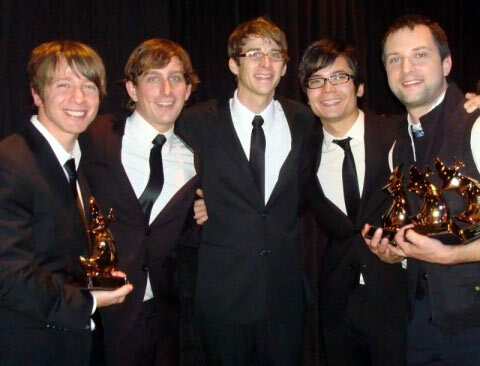 (Nashville, Tenn.) April 24, 2009 – Tenth Avenue North, the Best Selling and Most Played New Artist of 2008 (according to Nielsen SoundScan and R&R’s Year End Chart) was named New Artist of the Year by industry and fans last night at the 40th Annual GMA Dove Awards. The show was broadcast live on the Gospel Music Channel from the stage of the Grand Ole Opry House. This is the first year that fans were invited to vote in the New Artist of the Year and the Artist of the Year categories. And for more info on Michael W. Smith, visit the JFH Artists Database.